At Structure & Process we value a good online infrastructure for collaboration. Since we often work together virtually, the online environment is important for us. We need good tools that help us get stuff done and are enjoyable to use at the same time. We think we’ve got this figured out pretty well and we always like to share our practices. And so today we’ll show you how we use Trello as our main tool for online collaboration on projects and how it serves as our digital office. The goal? To show you how to use Trello to make your project successful! Trello is an online tool, which you can use in your browser or as an app for mobile devices. It’s main purpose is organising information in a visual and flexible way. It can be used for organising stuff individually and organising work as a team or company. In this blogpost we’ll focus on using Trello for collaboration. Working with Trello is like having a huge office with a lot of walls, unlimited sticky notes, coloured pens, markers and everything else you need to create organised overviews. Once your project or business gets bigger, moving to a new office is a lot of work. Opening a new board in Trello, however, is a breeze. As you grow, Trello can grow alongside of you. Whether your need is around project management, software development, creating a team board, keeping an archive or something else, Trello will do the trick. You just need to know about the different elements that are available and understand how to use them. We have experienced that new users only need a short introduction to the tool before they can jump in to an existing structure and contribute. Visually, it’s simple, appealing and clear. It just makes sense. For companies this means minimal time spent on training new employees. If you work on projects across organisational borders and a tool needs to be chosen, you’ll have less trouble convincing people to use Trello. Unlike many other tools, the free version of Trello doesn’t keep the best features for its premium users. Instead, all the essential features are there. And then if you want some more (e.g. customized backgrounds, bigger attachments, more integrations), you can choose for several paid plans. But the free version works more than good enough. 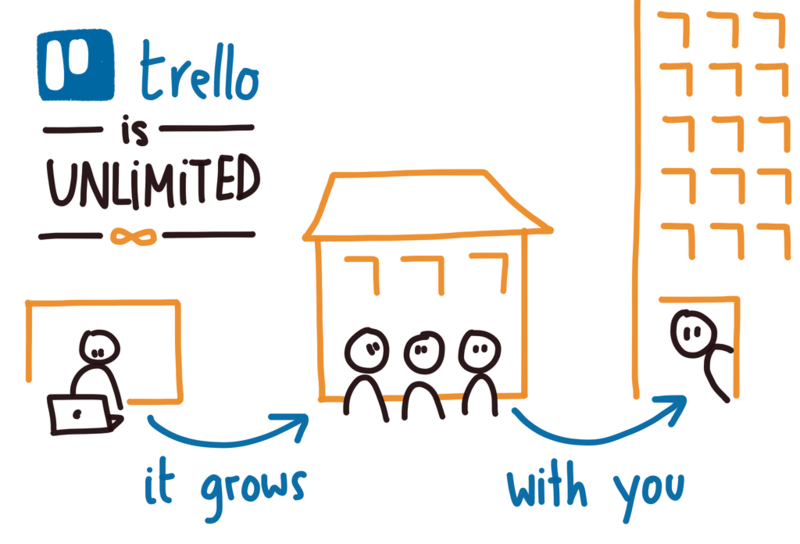 Now that you understand why to use Trello, it’s time to start looking at how it works. Below is an overview of the different elements, or building blocks, that Trello offers to organise your information. In its most minimal form, Trello will consist of a single board (usually you’ll have more than one). A board is like a wall on which lists and cards can be stuck. When you collaborate with other people regularly and you want them to have access to all your boards, you can form a team. A board will have at least one (but usually many more) lists. A list is a collection of cards. The card is where information is stored. You can write text, add pictures or other attachments, assign labels, due dates and add checklists. When users join a card or board (by adding their avatar to it), they become members. Members get updated of activity on cards and boards. Some teams chose to give each card one member to show the owner of the task or piece of information. Members of a board can comment on cards and @-message other members. It’s a good way to have a discussion around a topic or task. Teams and boards can be public (visible to the world) or private (for your organisation). All these elements can be used and combined in many different ways. It all depends on the purpose you’re trying to achieve. 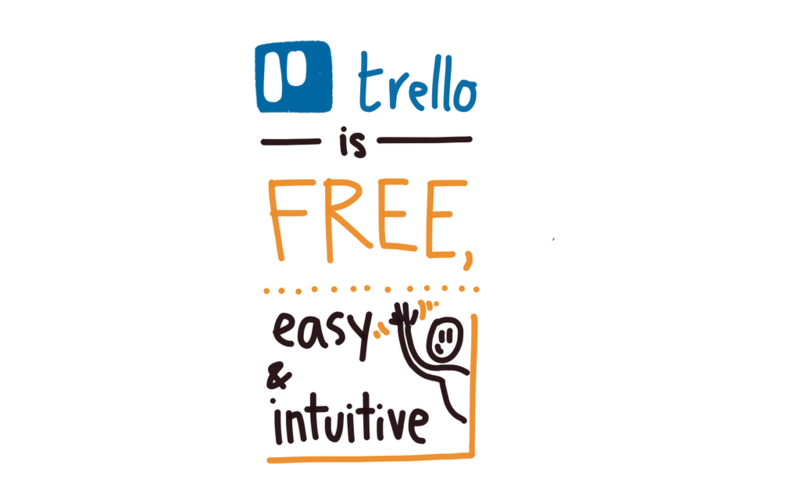 Are you looking to use Trello for your project, business or event? We believe this tool can support you! We can help you design and setup an initial setup, teach you the basics of how to use Trello and share our practices for maintaining it. 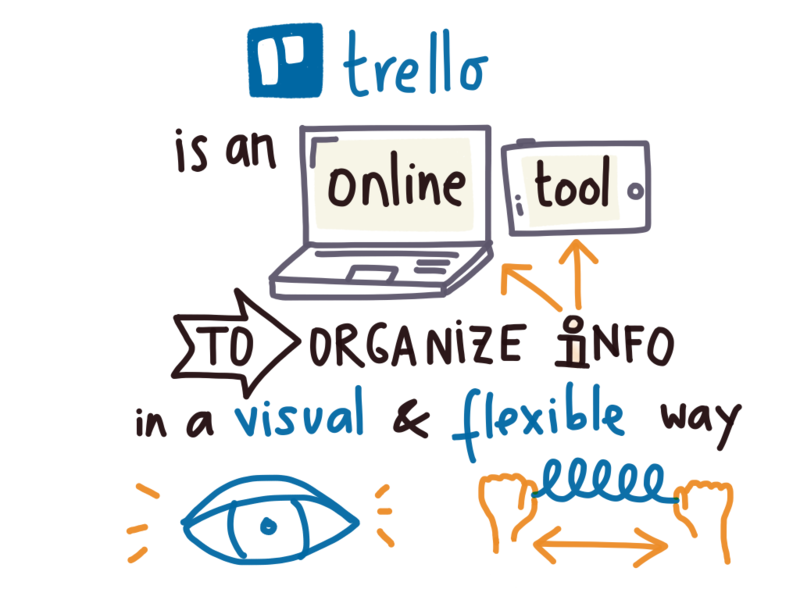 Contact us and tell us what you’re planning to use Trello for. We’d love to have a conversation around it. All illustrations in this article were made by Lara – Lara Listens.